Rennsport Reunion IV is over. There, I said it, and I won’t be saying it again any time soon. I’m certain, however, that this isn’t the end of Rennsport. The numbers speak for themselves, even though a ticket count has yet to be officially confirmed by Porsche. (We will let you know as soon as we know.) 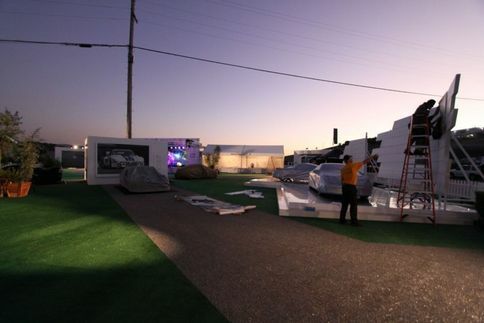 But a company insider told me it is estimated that well over 20,000 tickets were sold for the three day event. 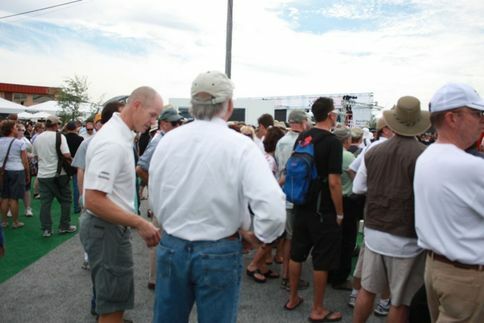 Compare that to the 3,500 tickets sold for Rennsport Reunion III at Daytona International Speedway — and that show was considered a huge success. 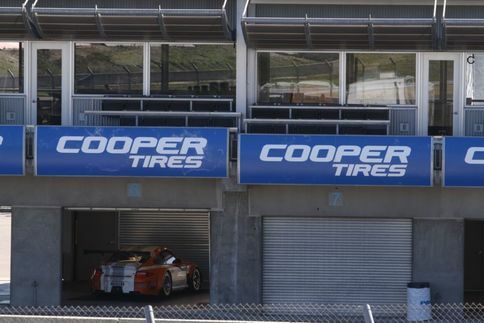 A couple reasons for the much larger turn out this time are Laguna Seca is a more accommodating venue for spectators, and previous Rennsports were intentionally designed on a much smaller scale. Still, the gap is huge. So while it’s saddening that most spectators have left and teams are packing up their cars, it’s hard for me to believe that the largest gathering of Porsches in the world wouldn’t happen a fifth time. 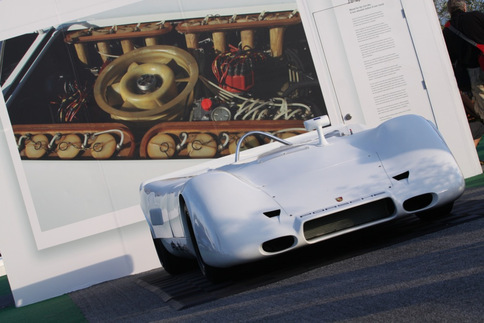 One of the few Porsche race cars to undergo extensive development but never to race, the 1971 917-027 acted as a test vehicle for an air-cooled flat-16 cylinder engine that was basically the 917’s flat 12 with four extra cylinders added. 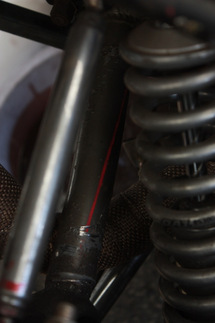 The twelve and sixteen both used a central crankshaft gear to drive engine accessories, and the cylinder heads were of almost identical design, except for a few changes to the inlet ports and ram tubes. In the end, though, the project was scrapped — even though in 7.2-liter form it made 880 hp at 8,300 rpm. That’s because a turbocharged flat 12 that was being developed was already promising to make much more power. 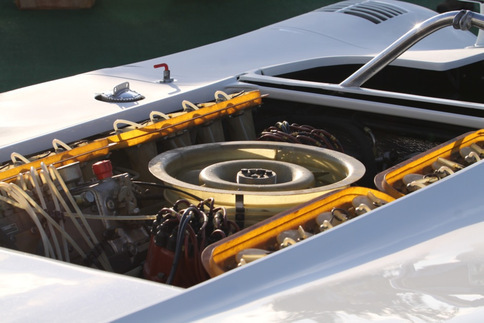 A couple of years later, in the 1973 917/30 Can-Am racer, that turbo 12 was capable of well over 1,000 hp. 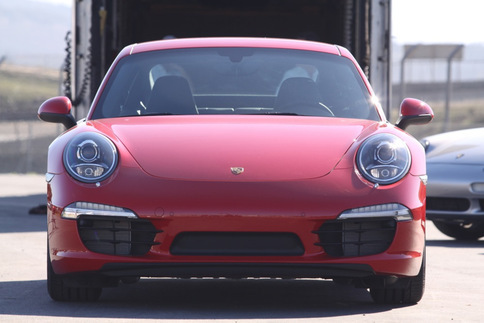 The new 911 on North American soil. 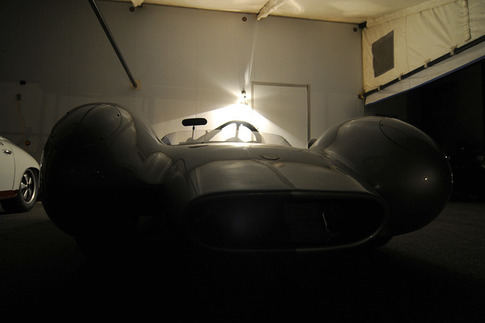 These shots were taken on Thursday, before Rennsport Reunion IV began on Friday, and before the official unveiling. 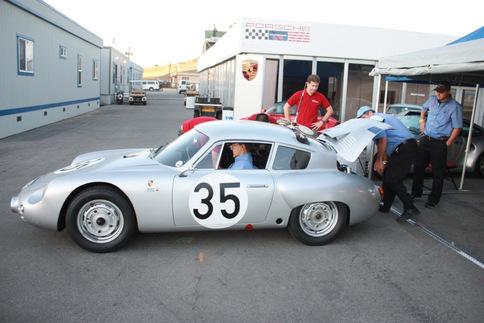 As Porsche raced its own works sports cars in the early 1960s, Robert “Bud” Hall with his company, Dolphin Engineering, was busy developing a race car which featured Porsche flat fours. The resulting 1962 Dolphin America Porsche was a left-of-center challenger to Porsche’s own race cars. About a dozen Dolphin Americas were built in Southern California by Livesay, a boat company, and they had lightweight fiberglass bodies. Ken Miles, who drove Ford’s GT40 to an overall win at the 1966 24 Hours of Daytona, competed in a Dolphin America equipped with a Porsche 1800-cc four-cam flat four in 1963. 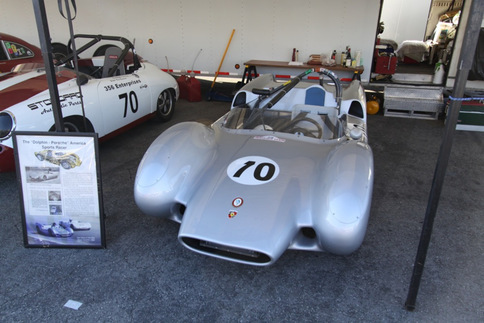 The Dolphin Porsche here at Rennsport Reunion IV was wrecked at Laguna Seca in 1977 and was sidelined until 1996, when current owner Vic Skirmants bought it with intentions to restore and race it. “The fellow who crashed the car had bought everything needed to put the car [back] together,” Skirmants says, which he did over a period of about 10 years. Skirmants’ car has a Porsche 1600-cc pushrod flat four which he claims makes 165 horsepower. That’s enough power to break an axle on this old car, which he did yesterday coming onto the front straight. 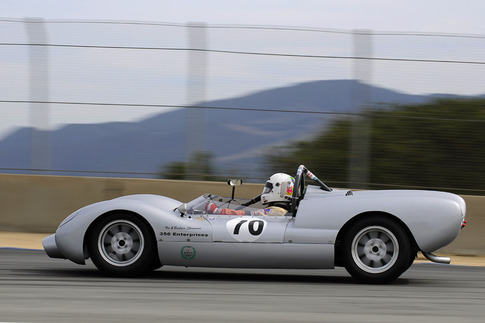 While it won’t race for the rest of the weekend, look for it at the Porsche Race Car Classic at the Quail Lodge in Monterey tomorrow. This 1964 911 is one of the first two 911s to arrive on American shores, and it was also the first 911 to win a race, ever. 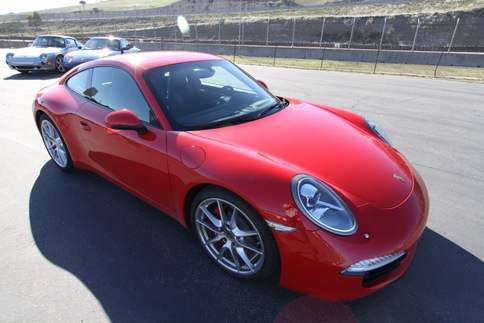 It was first sold to Brumos Porsche in Jacksonville, Florida who then sold it to Jack Ryan in 1965. Ryan, a VW dealer in Atlanta, decided to take it racing in 1966 against the wishes of Porsche’s then motorsports director Huschke von Hanstein. This might have had to do with the fact that Ryan wanted to enter it in the 24 Hours of Daytona. 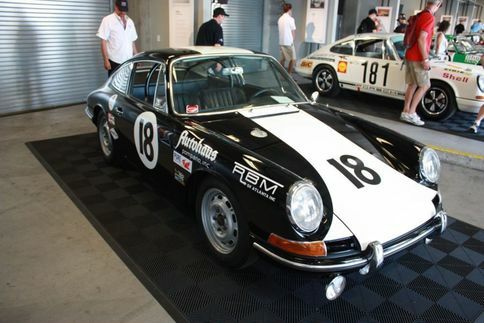 So Ryan raced the Daytona 24 in this very 911 (with co-drivers Bill Bencker and Linley Coleman) and won his class. After hard work and preparation yesterday, and with this morning’s drivers meeting over, early Porsches are running in their first practice session now. Pictured is Stanford University’s The Revs Institute Carrera Abarth GTL warming up for the session. 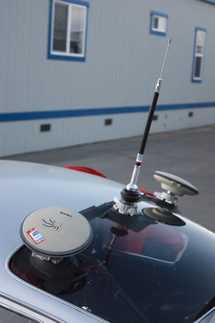 Besides being an Abarth 356, this Porsche is special because of the equipment attached to it, which monitors the car and the driver. 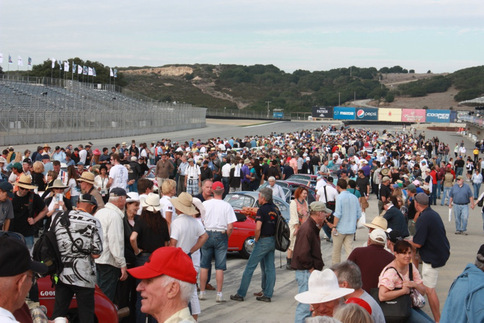 Rennsport Reunion IV officially starts tomorrow at 7:00 AM when the gates are opened to Mazda Raceway Laguna Seca. An hour later the first run group heads out for its first 20-minute practice session, and Excellence will be there to cover the event until it ends Sunday evening. 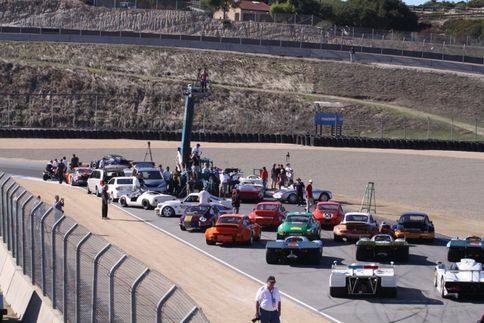 With hundreds of vintage Porsches filling eight run groups, thousands of Porsche enthusiasts, and some of the most well-known and respected names in the Porsche world attending the event, there’s sure to be plenty of action on and off the track. Be sure to visit this blog as it will be updated when possible each day. Here’s the first update: The GT3 R Hybrid has been spotted in the paddock, lurking in the shadows behind closed doors. 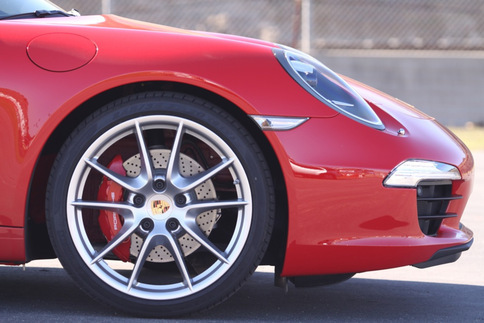 Find us on Facebook (Excellence: The Magazine About Porsche) and follow our Twitter account (ExcellenceMag) for updates, as well.